What is the best way to end your video? Naturally there is no “one size fits all” answer. There are however a number of areas to consider. There is often a tendency when creating a video and nearing the end of project to “put your pedal on the brake” and slow down your creative effort. This is a mistake because the ending of your video is the last memory your audience will have of your story. This means it needs to standout to be truly memorable. When you are creating a video you should know what you are trying to achieve. What is the point of your story and it is important to keep this in mind at all times. Every image and sound in your video must lead to the end of your story. Don’t get distracted by plot twists and ideas that do not add to the overall point of your story. 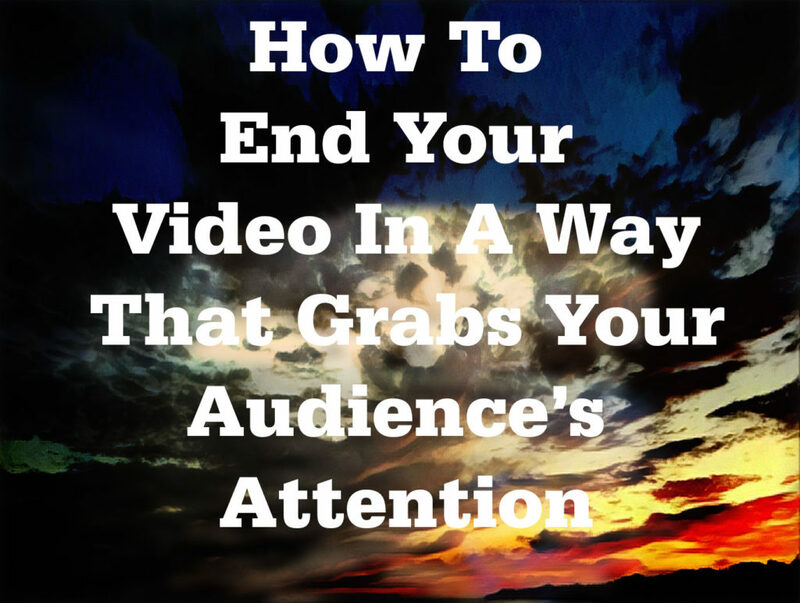 A dramatic twist at the end of your video always adds to the audience experience. While all brand stories do not have an obvious dramatic twist at the end, try to end your video in as interesting a manner as possible. The advantage of a brand using video to tell its story is that video storytelling helps create an emotional reaction with your audience. As a storyteller you are able to help them connect on an emotional basis by adding visual imagery that they can connect with. Always end your video by using emotional imagery that you know will emotionally connect with your audience. At the end of your video all elements of the storytelling should come together. There should be no loose ends that leave your audience wondering what happens next unless this is part of your strategy to get them to take a further action. What Do Your Audience Do Next ? Since you had an objective when creating your video, the ending should inspire your audience to take the next step. There should be no ambiguity about the step you want your audience to take next. Set out the next action in simple and easily achievable steps. To have impact a video needs to have purpose and this needs to be obvious to your audience. Keep your storytelling simple and to the point. When telling your video story you need to ensure that the opening gets your audience’s attention, the middle keeps it and the ending inspires them. There are no shortcuts to great video storytelling you need to tell inspirational stories in a way that your audience finds unique and useful. Posted in Video Content and tagged Audience Connection, emotional connection, storytelling, Video Ending, video story on March 17, 2019 by admin.